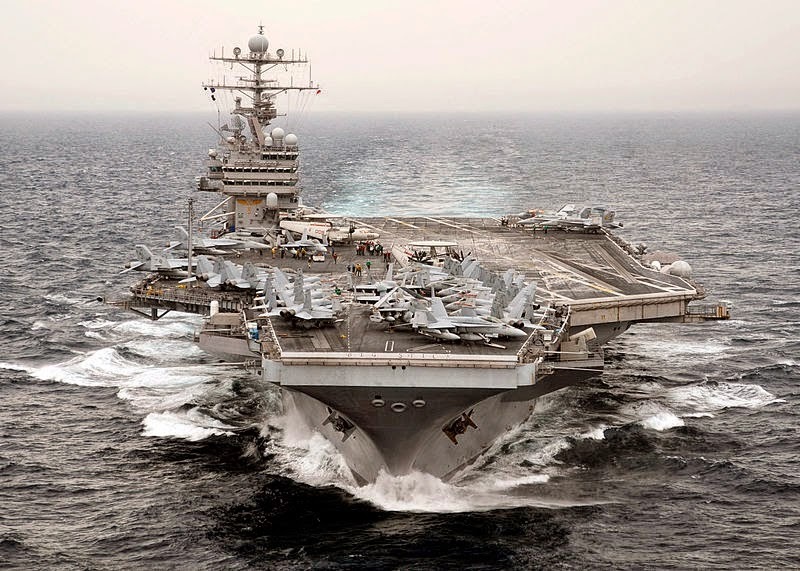 The U.S. aircraft carrier USS Theodore Roosevelt returned to the Persian Gulf on Saturday, after a short deployment to the Arabian Sea and the Gulf of Aden to counter an Iranian convoy suspected of carrying arms to the Huthis in Yemen. On Thursday, the Iranian convoy of seven freighters and two IRGC Navy warships reversed course in the direction of home, and is expected to reach the Iranian waters soon. Meanwhile, U.S. Secretary of Defense Ashton Carter said on Friday that a potential confrontation between U.S. warships and the Iranian convoy was averted through diplomatic channels. Carter added that the de-escalation was “a welcome event.” He did not elaborate what diplomatic channels were used in communicating with the Iranians. Lets just hope the IRGCN doesn't mistake USS Theodore Roosevelt for that defenceless barge. This one really bites back. Diplomatic channels, then. I'm dying to know the relevance of all this to Saudi Arabia's most recent move regarding Yemen! Fortunately, we'll never know. Same goes for the USS T.R. not mistaking Iran's quadruple missile launchers of C-802/803s for training rounds. It is even more true within the waters of the Persian Gulf. Praying Mantis style operations are what they are : the past, when America's foes such as Iran didn't have several hundred of camouflaged launchers on the entirety of their shores facing the PG that the Pentagon admits it has no accurate assessment so far due to difficulties relating to distinguishing dummies from real units. This and the fact that Iranian doctrine inherited from Chinese and Russian ones make them move assets and change defensive layouts on a regular basis. Anyhow, both sides relied on diplomacy rather than open confrontation on that issue, and this to me is a very promising sign for times to come and other settlements such as the nuclear dossier, obviously ! Unfortunately you have forgotten to mention that Iran has a non existent air force. When an opponent has total command of the air and space above all those assets you mentioned will be of limited use. It's undebatable that one tries to compare a country that hasn't changed their equipment since the 1970s to a country with a yearly budget of a trillion dollars.Go and figure. You seem to have a very narrow and biased understanding of a strategic balance. It actually works the other way around : if you cannot withstand heavy ballistic strikes that have the ability to devastate a sizable piece of your air-force infrastructure and assets on the ground within hours of an open conflict, you cannot establish air dominance that easily, that rationale works both ways. And you forgot to mention that those thousands of ballistic missiles and hundreds of anti-ship launchers + OTH radars didn't exist on Iranian shores and soil 30 years ago. And that Leon Panetta himself in a 2010 public Pentagon report underlined that very fact and the need for every major USN asset to completely move out of the PG if it ever comes to a shooting war with Iran to avoid unacceptable losses, specially the aircraft carriers stationed in Bahrain as part of the 5th fleet. Iran's air-force has never been a real factor in a first strike quality in Iranian doctrine, and is only secondary, supposed to augment an initial missile strike supposed to soften enemy zones before sending in the C-802/3 equipped aircraft firing them from a safe stand-off distance, they aren't stupid or crazy enough to try and send the birds in like a flying kamikaze cavalry. By no means is the IRIAF non-existent outside of your wishful mind. Is it older than other regional powers ? certainly. Has it been regularly upgraded by Russian and Chinese cooperation projects ? certainly as well. Just enough to do the job if needed. They aren't supposed to establish air superiority anywhere, it has never even been the stated goal of IRGC's goons. Uzi Rubin, father of Israel ABM project the Arrow, explicitly said in its many interviews that an army can establish something of a relative air-dominance if it can consistently make regular ballistic strikes against the enemy with a network consisting of a combination of a great number of independent launchers and scattered silos being able to hit deep into enemy territory and air-bases vulnerable by nature whatever defenses you have. And guess who recently multiplied and displayed a brand new stocks of TELs a couple years back by a magnitude of more than 10 going from dozens to hundreds to allow salvo fire, and the same with its silos built into mountains ? The fact that the US has a trillion-dollar defense budget has barely any relevance in this discussion. This is the very basis of asymmetrical warfare which has been the subject of a lot of military literature, and revisions of the USN's doctrine. They, contrary to you, take it VERY seriously. Anyway, let's even assume taking out the Iranian problem is such a piece of cake, why take a couple decades for Washington to take any concrete action and instead exclusively and persistently rely on economic sanctions, and then diplomacy leaving Iran with all its nuclear infrastructure intact and 5,000 centrifuges, to the dismay of many of its staunch allies ? Go and figure. The mere fact that no american administration since 2003 has ever taken direct military action against Iran is a proof that their deterrent stands to this day. The day it changes I'll revise my assessment, but with the nuclear standoff coming to a probable end by next July I do not feel I'm going to need that anyway. an "analysis" so bad that it's nearly funny.
" The mere fact that no american administration since 2003 has ever taken direct military action against Iran is a proof that their deterrent stands to this day"
Except that it's not "my" analysis. I quoted a couple of names to support my assertions, had you bothered to read my post you'd know already. Feel free to educate yourself on what they've produced so far, though somehow I doubt you have such ability (too much reading I'm afraid). For sure, going like "they have zero air-force they can't hurt us blabla their army is 35 years old blabla end of story" is as deep as is it brilliant and sufficient as an answer to any war scenario in the ME. The world is so simple with you Anon 5:46, that it's a shame you are currently the decision maker of exactly nothing. Being so inept at understanding the very notion of unacceptable projected losses for a given US administration while that factor lies at the very core of the absence of war today with Iran, despite so many years of heightened tensions is quite astonishing. Persisting financial crisis, budget cuts, lack of taxpayer appetite for another major war costing more than the Iraq and Afghanistan campaigns combined, thousands of unavoidable death for servicemen sitting in dozens of bases in direct vicinity of Iran's missile forces, unaffordable quagmire of global destabilization, do any of these ring a bell ? now who cares the IRIAF is not impressive in all this, the picture is so much bigger than your childish shortsightedness it's crazy. But still, go to the Pentagon and share your elaborate assessment of the balance of power here John Rambo, write them a letter, I'm sure they'll revise their stance overnight and prepare an Alpha Strike right away. Get your M-60, it's gonna get hot. sorry, bunky, but you didn't quote, you misapplied an extrapolation based on an imaginary idea that Iran's missiles are precisely guided..or even accurate. Lesson 2 : it's called "paraphrasing" and not "extrapolation", when nothing is added to already existing conjectures. Specially stuff written by people in charge and renowned analysts that have made the study of military balance their research job for decades. Since you're not worth enough of my time beyond that blog for me to find and paste every article, you'll have to look it up yourself if you ever get interested in snapping out of your Call of Duty dreamworld. As I said, go and share your opinion with Panetta and Rubin, they both need a hug, since last time I heard they seemed worried about the fact that Iran's missiles continue to gain in accuracy, going from 3-4 km CEP for early versions of Shahabs to a few dozen meters for latest variants, allowing them to threaten industrial-size targets. I think the biggest flaw in your ability to comprehend the big picture here is that you think Iran's missiles are somehow stuck in time and still nothing more than city busters like they were back in 2001, and that the US is somehow holding its almighty power because they decided they harbor secret love for the Iranians that they didn't have for Afghans or Arabs or Serbs in the past decade. Again, too bad you're not in charge, and too bad US military circles seem as silly as me in their public assessments and concrete lack of appetite for military action anywhere in Iran so far. Here, on second thought I feel sorry enough for you to drop this, and it was 3 years ago, not too much reading I promise, give it a go : http://www.bloomberg.com/news/articles/2012-07-10/iran-improves-ballistics-missiles-to-target-ships.